Jamie Sindelar from Horseheads, NY, won the 3-day cumulative bonus pool by six shots. He finished the week at 13-under par after rounds of 67-66-69. 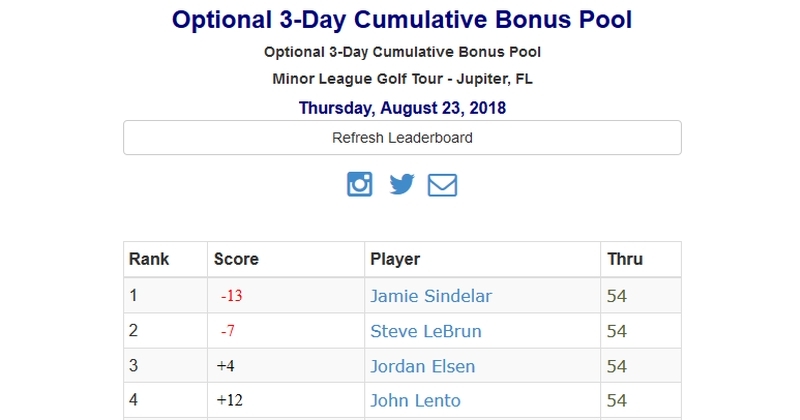 The cumulative 3-day bonus pool was an optional $100 entry fee for those players that were competing in all 3 one day events this week on the Minor League Golf Tour. The 3 events included Atlantic National on 8/20, Abacoa GC on 8/21 and The Evergreen Club on 8/23. Four players chose to enter the optional cumulative bonus pool. 100% of the entry fee went into the purse and the the top 33% and ties earned a check. 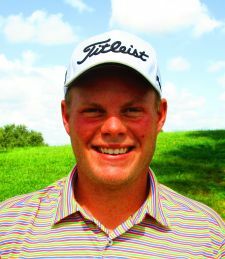 Congratulations Jamie on some great golf this week! Optional $100 per player entry for players participating in all three 1-day events this week @ Atlantic National, Abacoa GC and Evergreen (8/20, 8/21 and 8/23). 100% of the entry goes into the purse. 33% and ties of the participating players will be paid.